Where, I didn't find it. The videos you may well have seen before, just 3 short extracts from some of the dialogues we recorded a couple of months ago now! Ah, yet experience has taught me well. I need not blow mine own trumpet where another, by th' grace of god, may bloweth more vigorously. Excellent video. As already said, cool soundtrack. I really enjoy the screens, the game looks superb! May I have a wish, though? 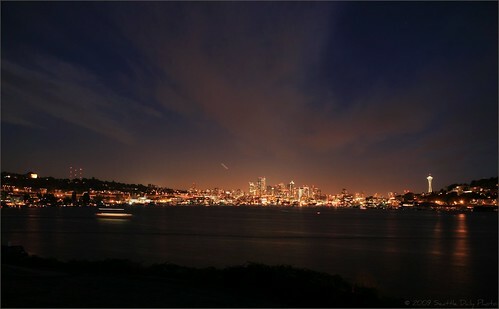 I would love some sneaky peek of how TakOH looks at night, especially in Seattle. Thank you! Seeing how there are so many Seattleites, and it's quite unlikely they would all switch their lights off for our dynamic night-time, we are currently tuning the night visuals. I wonder if the light pollution effect (glow) is planned? >Do my eyes decieve me, or are there cars on the road? I think those are streetlights. If they were cars, there would be a few more red tail-lights visible ! Look on the roads you will see "black boxes" on some, which may be 3d placeholders/cars etc following routes? There was a lot of feedback saying " oohh ok you fly around in a city... and why should i play another boring sim?" And thats completely not the case! TOH has so much potential in so many aspects and i would love to see the people realise this. The problem is not for TOH having it but to show the people out there what TOH is really about. Not many see the awesomeness of in- and out-animations in a trailer. Thats sadly the case. Especially in the case of TOH, the weapons, the storyline, the ability to get out of your helicopter and the moddability are very remarkable! If these features can get their propper attention of the public, i can guarantee it will be an even bigger success. So my wish for the next video: Unleash all this awesome stuff and lets show everyone that Take on Helicopters is not another ordinary flight sim but so much more! If you were to show 20 sec cuts of 3 helicopter types Police, military & civilian performing in thier roles. This would clear-up any confusion that this sim is NOT another FSX or Xplane but rather a Helicopter dedicated sim with lots of variety and excitement. The animations, stunning visuals and realistic flight model just push this title beyond what others have not attempted or i suspect could ever hope to achieve in the short term. Getting the balance between Look and function is something BIS do very well imo, they cram so much in and make it look good to. If you preview swat responding to a incident 'Black Hawk Down' style, with the police radio dispatcher in the background giving the pilot and team a brief while on route and then do 2 quick static cut's of a roof top landing or fast-rope. Still can't get over the new skies, they look so heavy. Awesome work. Just gets better & better!!! Butterflies? Aren't they in ArmA 2 already?